The What: Yamaha Unified Communications has begun shipping the Yamaha YAI-1 Wireless Microphone Conference Ensemble for installation out of the box into boardrooms and large conference rooms utilizing UC applications. The What Else: The professional audio system comprises an eight-channel Executive Elite wireless microphone package, two VXL1-16P Power over Ethernet (PoE), Dante-enabled speaker arrays with wall volume controller, a preconfigured digital signal processor, a five-port PoE switch, Dante AVIO USB adapter, and cabling. 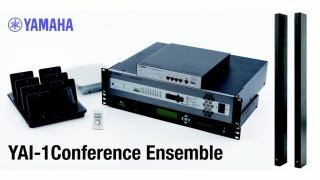 Once set up, the Yamaha YAI-1 Conference Ensemble is ready to connect to an organization's chosen UC platform through a single USB cable. Utilizing Yamaha's audio engineering expertise, the system features advanced acoustic echo cancellation (AEC) algorithms and dynamic microphone mixing technology that drives the audio experience and meets the requirement of enterprise IT departments for fast and simple installation, setup, and ongoing management. Two 16-element PoE powered line array speakers deliver high-quality audio throughout the room, and a wireless microphone system enables flexible audio capture and stress-free conversation. "The utilization of UC applications is no longer limited to personal offices, huddle spaces, and mobile environments,” said Phil Marechal, VP of business development and product management, Yamaha Unified Communications. “More and more organizations are turning to UC platforms in larger conferencing spaces and boardrooms, which requires equipment that can deliver the reliable, high-quality audio that ensures effective communication. The YAI-1 solves the real-world audio challenges of these applications while also streamlining systems and installation efficiencies for IT managers, a true testament to the breadth of Yamaha's product portfolio." The Bottom Line: Available in North America, the conferencing solution is a preconfigured USB audio system designed to provide a premium audio experience for an organization's chosen UC platform. The system is available in two microphone options: an eight-gooseneck microphone package for boardrooms, or seven tabletop microphones and one wearable microphone for presentation flexibility in conference rooms.